The SolutionCraft / SolCraft food truck vision. Imagine a food truck that is nearly fossil fuel-free. A mobile ecological classroom that demonstrates a truly regenerative kitchen. Where the meal itself becomes a medium for education - a tasty testament to the tremendous potential of renewable energy and regenerative design. A food truck that models energy independence and ecological interdependence. An ecocatering and food service provider at public and private events, farmers markets, and festivals. emergency preparedness, and community resiliency. And the infrastructure to provide sanitation, clean water, hot meals, and sterilized medical equipment in the ever increasing climate refugee crisis. A model ecological kitchen that can be scaled up to feed a fossil-fuel free world. 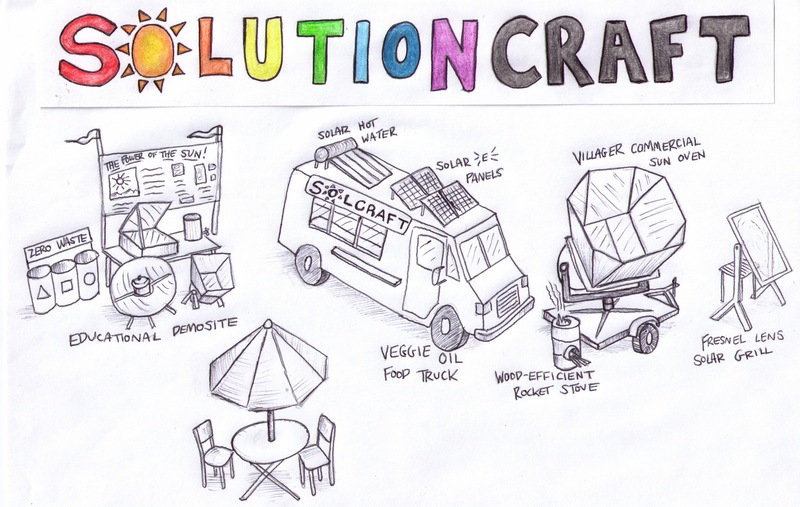 This is the vision for the SolutionCraft ecollective and the SolCraft Food Truck. Support our vision? Help us by ordering a SolutionCraft ecotechnology for your home, scheduling a school presentation or community workshop, booking a solar event, scheduling a consultation on emergency preparedness, or renting our massive Villager Sun Oven (Services page). We also need help with website design, graphic design, business planning, and more! We are starting small and scaling up, and everyone is welcome to get involved.